Cushioned rubber grips for comfortable handheld punching. Length 5-3/4", throat reach 5/8". 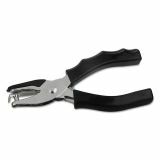 Universal Eight-Sheet Handheld 1/4" Hole Punch, Metal with Rubber Grip, Black - Great simple hole punch for simple jobs. Cushioned rubber grips for comfortable handheld punching. Easy-empty chip receptacle. Length 5-3/4", throat reach 5/8". 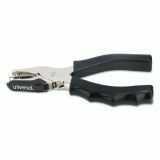 Sturdy, durable metal construction. (Sheet capacity is bases on 20-lb. bond.). Sheet capacities are based on 20-lb. bond. Note: As more heads are added to a punch, the sheet punching capacity decreases.